MTN has once again reviewed its Share 'N' Sell transfer fee. Transactions attract a nominal transfer fee, however, the applicable transfer fee is no longer flat; it depends now on the value of the transaction. 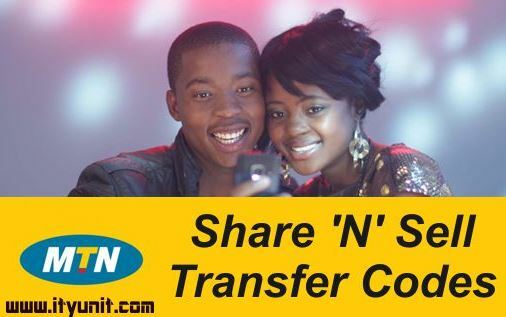 The new Share and Sell transfer fee according to MTN on its website takes effect from June 6, 2017 and applies to all new and existing prepaid and postpaid customers. There is no limit to the maximum time you can transfer in a per day. However, the amount cannot pass NGN10,000.00 from your phone and it must be only to MTN numbers. 1. To transfer credit from your phone to another MTN customer’s phone by dial the USSD code: *600*Recipient’s Number*Amount*PIN# on your phone and then click on send/press ok.
For example, dial*600*08031234567*1500*1234# and then send/ok. 2. You can also send by SMS with Transfer format Recipient’s Number, Amount and PIN to the number 777. For example, you can send an SMS with ‘Transfer 08031234567 1500 1234’ to 777. 3. The main difference in using the SMS option is that you will have confirm the transaction by replying with 'Yes' before the transaction can be processed. 4. When the transfer has been completed, you will receive a message informing you that the transfer was successful stating the amount transfer, transfer fee inclusive as well as your remaining balance. 1. If you are using the service for the first time, you will be required to change the default PIN. To do this, send an SMS with default PIN New PIN New PIN to 777. 2. You can also change your existing PIN by dialing *600*default PIN*New PIN* New PIN# on your phone and then click on send/press ok. For example, dial *600*0000*1234*1234# and then send/ok. 3. Immediately you change your PIN using any of the options above, you will receive an SMS informing you that your PIN was changed successfully. I don look tire oh. Didn't find any mistakes.